SDI Solar is a master dealer/ distributor for Solar Development, Inc.; manufacturers of the finest quality solar water heating systems since 1974. We have over 25 collectors and systems that have been rated by FSEC and SRCC. 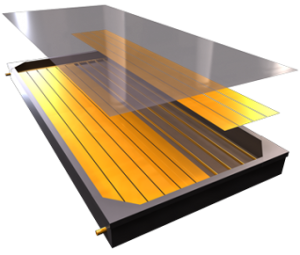 Our products enjoy some of the highest ratings of any Flat Plate Collector manufactured in the U.S. These quality products that have received numerous patents, honors and awards from DOE, NREL, and the state of Florida. Our experience has culminated in the Pacemaker II Hot Water System. This is our premier quality “open” hot water system that is perfect for our Florida climate. It includes our highly rated SD7 flat panel collector paired with a new bottom return hot water tank. All sized appropriately to meet your family’s needs. The controller component determines when the water should be allowed to circulate through the collector panel. The basic system includes a simple, reliable timer. But two alternate controllers are available. A Differential controller senses water temperatures in the collector vs. the tank, while the Photovoltaic panel actuates a DC circulation pump when there is sufficient sunshine. We also proudly represent and install solar equipment manufactured by Aquatherm Industries, Sanyo, GE, Mitsubishi, Solon, and other renewable energy companies.